Join us as the newly formed Colorado Rumble F.C. take on the Major Arena Soccer League 2 as part of the Mountain Division. See this fast-paced, high scoring professional indoor soccer family entertainment. 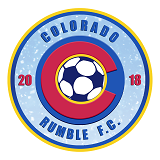 Your Colorado Rumble F.C. debut with a 6 game home schedule and hopes of making history in the playoffs. The Colorado Rumble F.C. call the Foothills Fieldhouse in Denver, Colorado home.